Patient recruitment is one of the biggest challenges when running a clinical trial. Repurposing samples for multiple research studies can help reduce the burden of patient recruitment and the burden on patients themselves. World Pharma Today recently published an article by Katheryn Shea, Global Biobanking Lead at Brooks Life Sciences, discussing a novel solution to the problem of patient recruitment . Patient recruitment and retention are two of the major challenges for clinical trial sponsors. Biopharmaceutical companies spend, on average, almost $900,000 on patient recruitment and retention when developing a new drug . Despite this investment, almost 50% of clinical trials fail to recruit enough patients during the initial recruitment period . 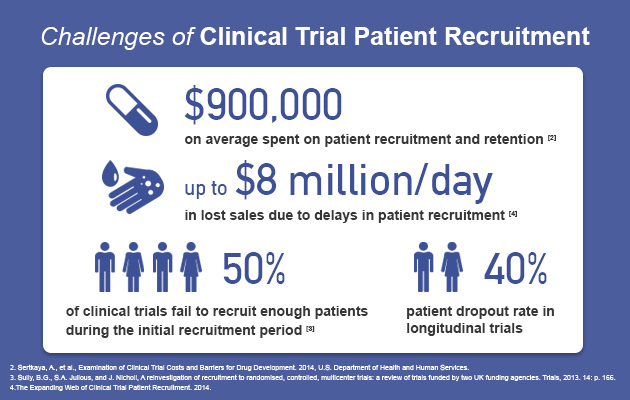 Delays in patient recruitment can push back clinical trial timelines, leading to lost sales of up to $8 million a day . These problems are compounded by patient dropout rates, which can be as high as 40% in longitudinal studies. Biopharmaceutical companies have conducted many studies looking at the causes of, and potential solutions for patient recruitment issues. These solutions include: using videos, podcasts and social media to increase patient and physician awareness of new clinical trials; and using medical animations, gamification and patient engagement platforms to retain patients . In the World Pharma Today article, Katheryn proposes a different solution to address the issues surrounding patient recruitment: repurposing samples for multiple non-interventional research studies. This approach is advocated by many government and funding agencies, including the Medical Research Council in the UK . Sample repurposing can accelerate clinical trial timelines and lower clinical trial costs. By reusing existing samples, biopharmaceutical companies can reduce the reliance on new patient participants and lower the costs associated with clinical trial sites, clinical procedures and staff. These can account for over 50% of the cost of a clinical trial and can add up to hundreds of millions of dollars . Sample reuse also reduces the burden on patients by reducing the need to collect new samples. Sample collection, processing and storage must be carefully planned in order to reuse samples in multiple studies. Appropriate patient consent must be obtained at the time of collection [6-8]. Samples should be stored using methods that minimize freeze-thaw cycles and maintain sample integrity . All methods and procedures must comply with international regulatory requirements. Biopharmaceutical companies can maintain sample quality and repurpose patient samples by implementing an integrated, standardized sample management system. Brooks Life Sciences’ Sample Hub is a global, interconnected platform of sample processing, biorepository, and transport facilities, strategically located in North America, Europe and Asia. Our facilities have FDA approval, ISO 9001:2015 accreditation and CAP and CLIA certification and are staffed with highly trained sample management experts. Above: Brooks Life Sciences’ Sample Hub platform is a flexible, integrated clinical sample management solution. Sample Hub is a flexible platform. Our experts partner with clients to configure sample management solutions to individual requirements. This can include managing active studies, planning and managing future studies and storing archived samples. Consolidating samples within one global, interconnected platform minimizes sample handling delays, which reduces clinical trial costs and timelines. Samples stored within the platform are retrieved and dispatched within 24 hours. Our team of experts can manage sample associated vendor relationships, sending samples to CROs, specialty labs or central labs as needed. This integrated system saves time and also maintains sample integrity, chain of identity, chain of custody and chain of condition. An integrated sample management system allows biopharmaceutical companies to repurpose clinical samples and address the problem of patient recruitment. To learn more about Brooks Life Sciences Sample Hub Services click here. Shea, K., Solving the Patient Recruitment Dilemma, in World Pharma Today. 2018. Sertkaya, A., et al., Examination of Clinical Trial Costs and Barriers for Drug Development. 2014, U.S. Department of Health and Human Services. Sully, B.G., S.A. Julious, and J. Nicholl, A reinvestigation of recruitment to randomised, controlled, multicenter trials: a review of trials funded by two UK funding agencies. Trials, 2013. 14: p. 166. The Expanding Web of Clinical Trial Patient Recruitment. 2014. Bower, P., et al., Interventions to improve recruitment and retention in clinical trials: a survey and workshop to assess current practice and future priorities. Trials, 2014. 15: p. 399. Human Tissue and Biological Samples for Use in Research: Operational and Ethical Guidelines, M.R. Council, Editor. 2014, Medical Research Council. Sariyar, M., et al., Sharing and Reuse of Sensitive Data and Samples: Supporting Researchers in Identifying Ethical and Legal Requirements. Biopreserv Biobank, 2015. 13(4): p. 263-70. Tindana, P., et al., Ethical issues in the export, storage and reuse of human biological samples in biomedical research: perspectives of key stakeholders in Ghana and Kenya. BMC Med Ethics, 2014. 15: p. 76. NCI Best Practices for Biospecimen Resources. 2016.